Feline Panleukopenia also known as feline infectious enteritis and feline distemper; it is caused by a resistant virus that may remain infectious for more than a year at room temperature on inanimate objects. It is transmitted through blood, urine, feces, nasal secretions, and even by fleas of infected cats. The disease destroys many of the cat’s white blood cells and is fatal for 50% to 70% of the cats that have it. Cats with panleukopenia seem lethargic, vomit, have a high fever, and are dehydrated. Sickness may go on for 3–4 days after the first signs are noticed and before death occurs. Immunity to the disease can be developed by a series of vaccinations administered when the cat is still a kitten, followed by boosters every 3 years after the first year. Feline Viral Rhinotracheitis, Feline Calcivirus, and Feline Pneumonitis are all respiratory diseases of cats. 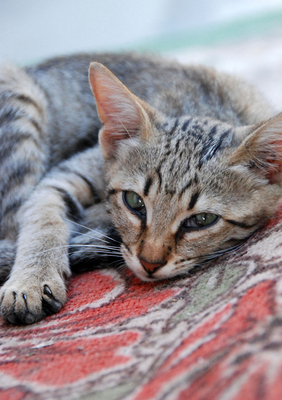 Infected animals are contagious to other cats and may show either acute or chronic respiratory signs. The above noted vaccinations are usually given combined as one injection. It is typically noted as an FDRCP on the records. Feline Leukemia Virus (FeLV) is often a fatal disease that affects the cat’s immune system. This increases susceptibility to other diseases, including leukemia. Symptoms of the feline leukemia virus include weight loss, recurring or chronic illness, lethargy, fever, diarrhea, unusual breathing patterns, and a yellow color around the mouth and whites of the eyes. This vaccine needs to be boostered annually for those cats at risk. We are now recommending vaccines every three years, after their first annual booster, for most cats. We do recommend a once-a-year exam just to make sure your cat is physically healthy and possibly spot early clues for potential health problems. Consideration should be given to doing bloodwork during the years that do not involve vaccines, especially in the senior (8 – 10 yr plus) individuals, to detect early system changes before they cause serious problems. ** Feline leukemia vaccine must be given as a two-part series when receiving it for the first time (regardless of the age of your cat at the time of its vaccination) to ensure that your cat is fully vaccinated against the disease.